The Center for Jewish History's newest exhibit: "Jews in Space." NEW YORK — A new exhibit at New York's Center for Jewish History chronicles the ties between Jewish culture and exploration of the cosmos, and includes some incredible artifacts from the history of astronomy and space exploration. "Jews In Space" officially debuted at the center on Monday, Feb. 26, in partnership with the YIVO Institute for Jewish Research. Walk through the exhibit halland you'll find rare 18th and 19th century rabbinic tomes on astronomy in Hebrew, German and Yiddish, as well as a dreidel, a Torah pointer, a traveling menorah and other religious artifacts that traveled into space with the first Jewish American astronaut, Jeffrey Hoffman. The exhibit also features mementos from other Jewish space travelers, memorabilia from science fiction, and a detailed timeline of Jewish accomplishments in astronomy and spaceflight. The "Jews In Space" exhibit at New York's Center for Jewish History got its name from Mel Brooks' parody film "History Of The World, Part 1." 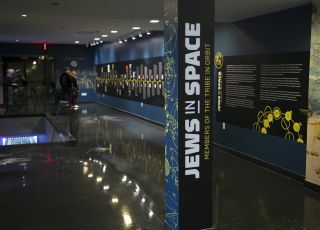 Visitors explore the new "Jews In Space" exhibit at the Center for Jewish History in Manhattan. "After some research, it became apparent that there was a fair amount of material in the realms of traditional texts, science fiction, pop culture, science and actual space programs,: Portnoy said. "[Melanie and I] both love Mel Brooks, so the title became 'Jews in Space,' which was taken from a parody trailer that appears at the end of 'History of the World, Part I.'" The "Jews in Space" exhibit in New York was inspired partially by rare rabbinical astronomy texts from the 16th to 19th centuries. The exhibit pays homage to its namesake with memorabilia from Brooks' parody film, including a signed photo of the "Star Trek"-influenced Star of David-shaped spaceships featured in the movie. Although Meyers' husband originally envisioned a science fiction exhibit, it seems that no one is disappointed that the project took a turn toward space history. "Who wouldn't want to celebrate astronomy and spaceflight? They're compelling topics," Portnoy said. "And also, perhaps, not quite the thing one expects from a Jewish historical institution." The original suggestion to create an exhibit on Jews in science fiction was not lost, since the space exhibit features memorabilia from science fiction shows and books. The Center for Jewish History will continue to celebrate the cosmos with several family-friendly events in the coming months. On April 15, the center will open early for visitors to view the exhibit and for children to take part in space-themed arts and crafts while the adults get a detailed tour of the exhibit from the curators. There will be another space-themed arts and crafts night on May 6 and then on the following day, May 7, five-time space shuttle astronaut Hoffman will be at the center to talk about his missions and what it's like to practice Judaism in space. Included in the "Jews in Space" exhibit are religious artifacts that traveled into space with the first Jewish American astronaut, Jeffrey Hoffman. Stay updated on space-themed events at the Center for Jewish History here.